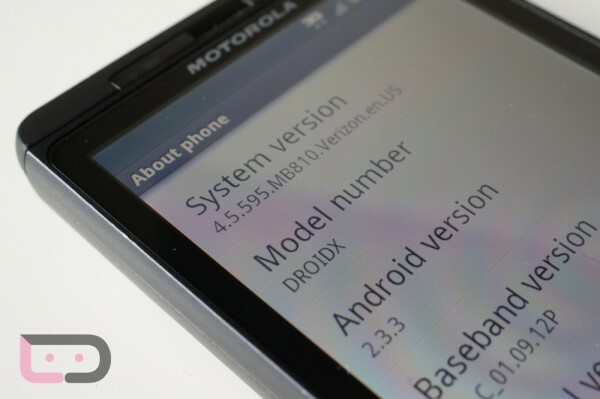 Somewhere on the internet you heard that Motorola was hoping to get an official build of Gingerbread (Android 2.3) for the DROIDX signed off on by Verizon today…oh that’s right, you heard it right here from us. And according to our homie P3Droid, Verizon has done just that, meaning we are days away from seeing the build made available to our phones. So how do you get your phone to a state where it can receive the update? Well, a method has been provided that doesn’t include flashing an SBF back to Froyo. A new build (4.5.595) has been made available and will apparently allow you to accept the update when it arrives. I know that some of you just got done flashing 4.5.591, but P3 assures us that you need to jump up to .595 in order to get the official build which should be 4.5.596. And if you are running either of the other two leaks (.573 or .588) then you’ll need to update to 4.5.595 as well. Make sense? Update: If you want to receive the official update, you’ll need to be on the “Full Stock – No Root” version. 1. Drop the file on your SD card. 2. Boot into recovery using the Bootstrap. 3. Install the zip through Clockwork Recovery. 4. Enjoy version 4.5.595 of GB. Full support can be found at MyDroidWorld.